The book starts with Operation Barbarossa, the German invasion of the USSR in June 1941, and the subsequent drive into the Soviet Union. Its main focus is the Battle of Stalingrad, in particular the period from the initial German attack to Operation Uranus and the Soviet victory. It details the subsequent battles and war crimes committed by both sides. The book ends with the defeat and surrender of the Germans in February 1943 and the beginning of the Soviet advance on Germany. 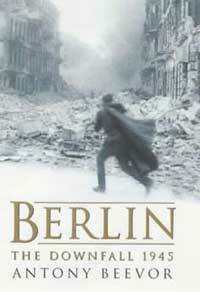 Beevor returned to the subject with Berlin: The Downfall 1945. Stalingrad was published in the Philippines under the title of Stalingrad: The Fateful Siege 1942-43, and has been translated into 18 languages. The English paperback version was published by Penguin Books in 1999. Keith Lowe, writing in The Telegraph, notes that Stalingrad transformed both Beevor's reputation and that of military history, making it from something only for "retired colonels and armchair fantasists" into a "sleek, attention-grabbing subject" always on the bestseller lists. Lowe argues that "What made [Stalingrad] so refreshing was the way that he combined academic rigour with a storyteller’s sensibility. While he always kept a grip on the view of the battle from above, his true skill was in describing the way it looked from below, from the point of view of the ordinary soldiers", with pacing and sense of character providing almost the readability of a novel. Richard Bernstein, in The New York Times, writes that "the colossal scale of Stalingrad, the megalomania, the utter absurdity, the sheer magnitude of the carnage in what many military historians see as the turning point in the war, are marvelously captured". He concludes that Stalingrad is "a fantastic and sobering story, and it has been fully and authoritatively told in Mr. Beevor's book." Stalingrad won the first Samuel Johnson Prize, the Wolfson History Prize and the Hawthornden Prize for Literature in 1999. While the first translation was "flawed" according to Beevor, second translation of 2015 got banned in Ukraine. The author was reportedly "dumbfounded" at a decision by Ukrainian authorities to ban the import of 30,000 copies of the new Russian translation of his book. The ninety Jewish children were shot the next evening by Ukrainian militiamen, to save the feelings of the Sonderkommando. The atrocity was committed by Ukrainian militiamen, since the command decided to "save the feelings" of German soldiers. On the following day, the children were shot by Ukrainian nationalists, to "save the feelings" of the Sonderkommando soldiers. N/A Акцию совершили украинские полицаи, так как начальство решило «поберечь чувства» немецких солдат. На следующий день детей расстреляли украинские националисты, чтобы «поберечь чувства» солдат зондеркоманд. In another instance, where the original English text refers to "two police battalions" having participated in the massacre at Babi Yar, the new translation refers to "two battalions of Ukrainian nationalists". [nb 1] Ukrainian translator Steve Komarnyckyj points out, that the text might be "manipulated with political intent". The ban was due to the Ukrainian Law No. 1780-19, which took effect in early 2017. It introduced amendments to legislation aimed at "restricting access to the Ukrainian market of foreign printed material with anti-Ukrainian content". The law imposes a permit system for import of printed material from an aggressor state (as of January 2018, this applied only to Russia) or from occupied Ukrainian territories. ^ a b In the context of World War II, "Ukrainian nationalists" usually means participants and supporters of Organization of Ukrainian Nationalists (OUN) or Ukrainian Insurgent Army (UPA). ^ a b Lowe, Keith (25 July 2002). "In praise of Antony Beevor". The Telegraph. Retrieved 2 February 2015. ^ a b Bernstein, Richard (26 August 1998). "BOOKS OF THE TIMES; An Avalanche of Death That Redirected a War: Stalingrad". New York Times. Retrieved 2 February 2015. ^ "The Samuel Johnson Prize for Non-Fiction: Stalingrad (Penguin) By Antony Beevor". The Samuel Johnson Prize. Retrieved 2 February 2015. ^ "Previous winners (1999)". Wolfson Foundation. Archived from the original on 7 February 2015. Retrieved 2 February 2015. ^ "Writer of the month: Stalingrad and Berlin – researching the reality of war". The National Archives. 25 March 2013. Retrieved 2 February 2015. ^ a b c O'Connor, Coilin; Heil, Andy (17 January 2018). "Historian Beevor 'Astonished' At Ukraine Ban On Best-Selling 'Stalingrad'". RFE/RL. Retrieved 31 January 2018. ^ Грабовський, Сергій (19 January 2018). ""Сталінград" Бівора: російська провокація й українські "експерти"". RFE/RL (in Ukrainian, Russian, and English). Retrieved 31 January 2018. ^ Flood, Alison (19 January 2018). "Stalingrad author Anthony[sic] Beevor speaks out over Ukraine book ban". The Guardian. Retrieved 31 January 2018. ^ Coynash, Halya. "Ukraine imposes baffling ban on work by renowned English historian & others". Human Rights in Ukraine. The Kharkiv Human Rights Protection Group. Retrieved 2 February 2018. Volgograd, formerly Tsaritsyn, 1589–1925, and Stalingrad, 1925–1961, is an industrial city and the administrative centre of Volgograd Oblast, Russia. The city lies on the western bank of the Volga River. The Baillie Gifford Prize for Non-Fiction is an annual British book prize for the best non-fiction writing in the English language. It was founded in 1999 following the demise of the NCR Book Award. With its motto "All the best stories are true", the prize covers current affairs, history, politics, science, sport, travel, biography, autobiography and the arts. The competition is open to authors of any nationality whose work is published in the UK in English. The longlist, shortlist and winner is chosen by a panel of independent judges, which changes every year. The award is named for Baillie Gifford, an investment management firm and the primary sponsor. Since 2016, the annual dinner and awards ceremony has been sponsored by the Blavatnik Family Foundation. Major Nikolay Dmitrevich Dyatlenko was a Soviet officer, interrogator and translator who was part of a team that attempted to deliver a message of truce to the German Sixth Army at the Battle of Stalingrad in January 1943. He also acted as the translator at the interrogation of Field Marshal Friedrich Paulus a few weeks later. 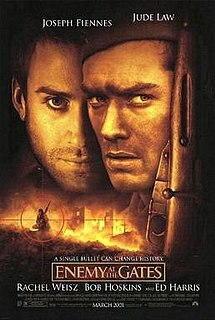 Stalingrad is a 2013 Russian war film directed by Fedor Bondarchuk. It was the first Russian movie released in IMAX. The film was released in September 2013 in Volgograd and October in Russia before its international release in subsequent months. The film was selected as the Russian entry for the Best Foreign Language Film at the 86th Academy Awards, but it was not nominated. Stalingrad received the I3DS Jury Award for Russia in 2014. Sergei Petrovich Nikonenko is a Russian actor. He performed in more than eighty films since 1961.